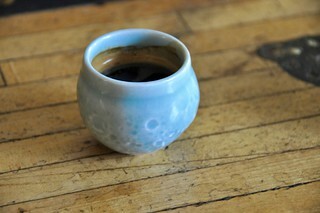 The Moon Shot Espresso Cup has gone through several iterations. In the beginning, it was a concept design that I uploaded to Shapeways, only to have it rejected—their old ceramic printing process wasn’t up to the cup’s level of detail. Fortunately, around that time I found my way to London for a year, where I connected with the talented ceramicists Ellie and Zac at the Institute of Making. 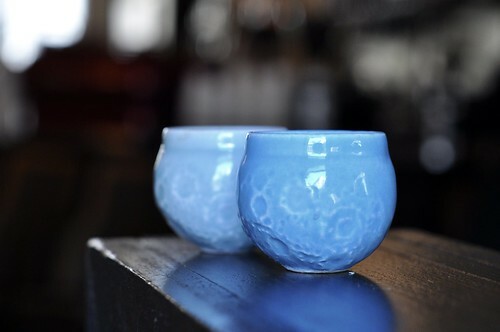 With a considerable amount of help from them and others, I was able to cast my own ceramic Moon Shot cups from a 3D printed plastic positive. I went through two versions of the cast cup. Ceramics shrink in the kiln, and the first iteration was positively teeny. The second time around I started with a much larger 3D print, resulting in a cast cup that was just barely big enough for a decent espresso. Happily, Shapeways then launched a beta program for a new porcelain 3D printing process that was capable of greater detail and a number of new finishes. I uploaded a new cup design and ordered it in matte black. The result was very promising! Lots of detail and a lovely finish. The downside was that the cup I had uploaded was far too big for an espresso—it was closer in size to a coffee cup. The first cup was too small. The second, well, the second was too big. The third chapter in this story began just a month or two ago. 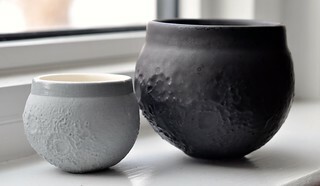 Shapeways contacted me to say that porcelain was soon going to be available to the public, and they wanted to feature the Moon Shot Espresso Cup as part of the launch! Their interest motivated me to go through one more design iteration, in this case simply scaling the cup down to the right size. Happily Shapeways recently made that easier, with a feature to scale uploaded 3D models. With that, I’m pleased to introduce the newest Moon Shot Cup, the Mark III. The third cup… was juuuuuust riiiiiight. Shapeways must sprinkle some magic dust on their porcelain prints, because they got the final size pretty much bang on. These cups hold almost exactly 2.5 fluid ounces (around 73 ml), which is great for my morning espresso (though my local barista claims it’s more of a macchiato cup). 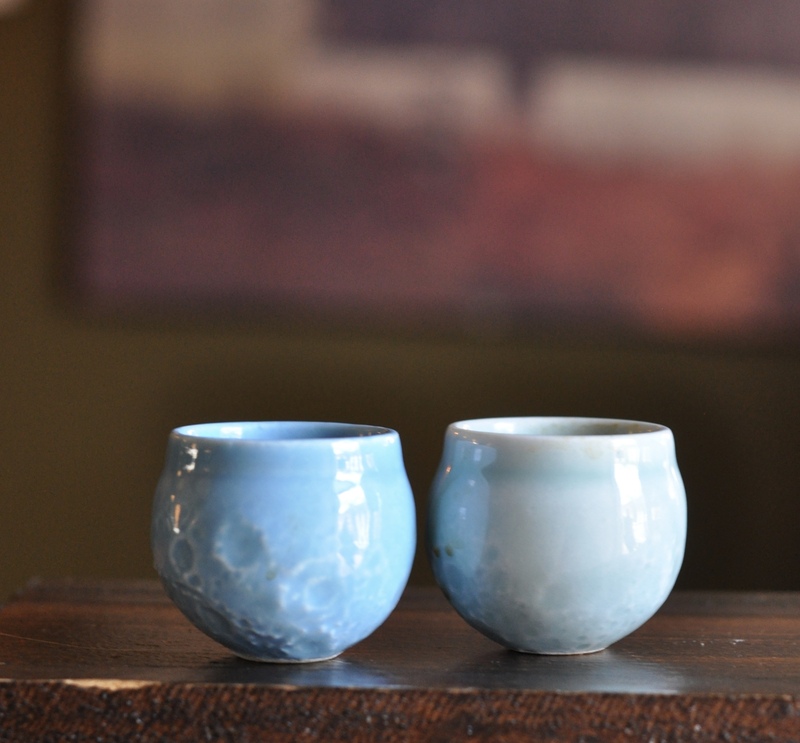 Also, for the first time, I ordered these cups with a couple of shiny glazes (Blue and Celadon Green in these examples). The results are better than I expected: you can still see a lot of the details of the moon surface under the glaze, and there’s even some nice colour variation near sharp features. 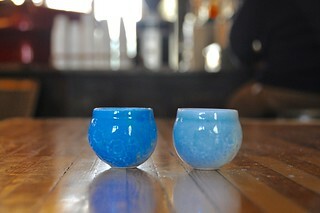 Shapeways also produced some of their own copies of the cup and photographed them for their marketing materials. Those other glazes look great, though I think shiny white might obscure surface features a little too much. With the Mark III, I think it’s safe to say that the Eagle Has Landed. Time to move on to the next cup! 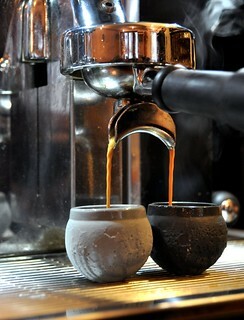 One Response to "Moon Shot Espresso Cup, Mark III"
Thank You for the Story! It is this journey that inspires me to keep on keeping on. I love how you explained the frustration instead of hiding behind it. I especially love how Shapeways contacted you to help them. They saw your potential. You made it happen.